The morning of the 25th was busy. I had an early morning meeting with Dr. Tachi Yamada from the Bill & Melinda Gates Foundation to discuss about the upcoming February conference in Tokyo and other meetings that I had arranged. In the afternoon, I attended a session related to innovation and joined the beginning of plenary session “New Drivers of Development” chaired by Ms. Indra K Nooyi, Chairman and Chief Executive Officer of Pepsi Co. 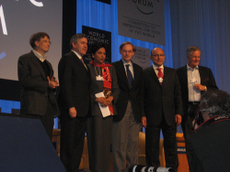 Participants were Mr. Bill Gates, Mr. Gordon Brown, Prime Minister of the United Kingdom, Mr. Robert B Zoellick, President of World Bank, Mr. Michael Treschow, Chairman of Unilever and Mr.Trevor Manuel, Minister of Finance of South Africa (photo1,2). The reason for attending only the beginning was because I had a session with Ms. Sadako Ogata, Bono(photo3) and some big figures who represent Japan. We discussed how Japan can show their initiative globally to make a move on development in Africa, TICAD and G8 summit and respond to the expectation from the world. Other participants were Mr. Okuda, former Chairman of Toyota Motor Corp, Mr. Yasuhisa Shiozaki, Ms. Yoriko Kawaguchi, Mr. Matsuura, Director General of UNESCO and Dr. Komiyama, President of the University of Tokyo. 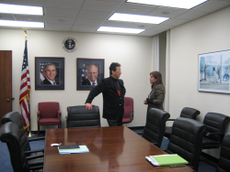 I met with Bono and his staff yesterday and I think we will continue to work together in the future. 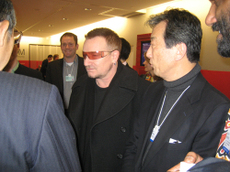 Bono respects Ms. Ogata very much. He is well aware of Japan’s successful and long ODA history in Africa which is different to that from Europe and America. This year is an important year for Japan and he is seriously considering how Japan can show its presence. I was surprised at how much we can do. I learned a lot. He also said that during the 3-day concert in Japan, 120,000 fans gathered, which I later heard that he tried several attempts to send his message to the world through the crowd. He feels the passion that everybody is considering what they can do to make a change, but with the current political level, it is not well communicated inside and out. Also, John Gage from Sun Microsystems joined. 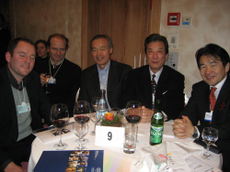 He supports Bono and Al Gore’s activities and I’ve been meeting him every year in Davos for 4 years. I hope my blog readers give consideration to what we can do and expand our will to the vast world to realize it. 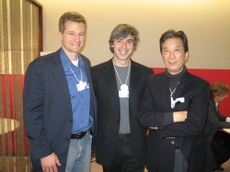 Then, I ran into Larry Page(who is very interested in climate change and global health and established the Google Foundation), the founder of Google which I introduced in last year’s report with some photos and Steve Grove from YouTube (photo4,5). Tonight, Prime Minister Fukuda will arrive at Zurich. He will arrive at Davos the following morning and meet with Tony Blair, Mr Bono, Bill Gates and will deliver a speech. After that, I heard his schedule is full with luncheon meetings with the business community. I wonder whether the Prime Minister is really satisfied with his speech draft, but the speech writer must have worked hard to prepare it. The world’s opinion will show us the result. How will Japan be reported? How do the foreign media see Japan? What is the real opinion that doesn’t show up? 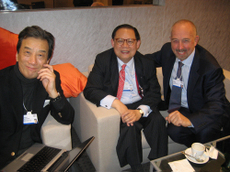 At night, I met a lot of people at the ASEAN reception, but ended up with the usual members, Victor Chu (He is well known everywhere. He said that he travels 250 days a year for business. Wow, what an energy!) and John Gage. We had a drink at a bar at the hotel next door. 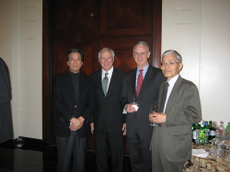 Dr. Michael Porter from Harvard Business School joined and we had a great time together. This is the excitement of Davos. The last keynote speech on the first day was by the US Secretary of State, Ms. Rice. She delivered a clear and firm message about the current role of the US and the responsibility for the US and the world. 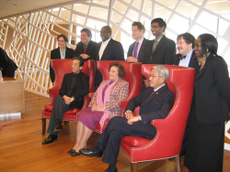 Then, the political and business leaders from the world, such as Mr. Blair, Mr. Kissinger, Mr. J Dimon(JP Morgan and Chase), Mr. KV Kamath(ICICI Bank, India), Ms. IK Nooyi(CEO of Pepsi Co, she graduated from the famous IIT in India…. Can you imagine this in any Japanese company?! ), Mr. DJ O’Reilly(CEO, Chevrons), Mr. Wan Jianzhou(China Mobile Communications Corporation) etc, went up the podium for a Q&A session. Ms. Rice handled this session very nicely. This is indeed world class. Answering to tough questions in front of a big crowd. This year, there were especially a large number of participants including 20 or more Presidents and Prime Ministers. Even only on the first and second day, Mr. Karzai(Afghanistan), Mr. Musharraf(Pakistan), Mr. Yushchenko(Ukraine), Mr. Simon Perez(Israel), Al Gore and Bill Gates were there. 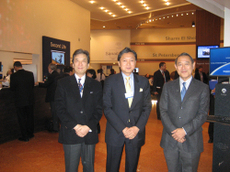 From Japan, ever since Prime Minister Mori attended in 2001, Prime Minister Fukuda will attend. As a hosting country for TICAD and G8 Summit, the world is watching Japan’s leadership of global agenda. What kind of message will he give to the world? Let’s hope it will be a high toned, powerful speech that reflects as a Prime Minister of the second largest economic power, not something drafted by bureaucrats. Regardless of domestic circumstances, ‘it’s spoken message that counts as politician.’ It is important to strategically communicate to the overseas press. 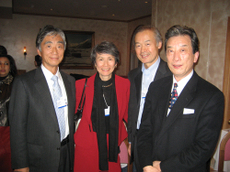 Needless to say, Ms. Sadako Ogata, President of JICA, is a global figure representing Japan, but also the global minded professors from Hitotsubashi University School of Business Administration, Hirotaka Takeuchi and Yoko Ishikura as well as Heizo Takenaka of Keio University are taking an active role in various panels and acting as session leader. In a brainstorming session called WorkSpace, Prof. Takeuchi showed his amazing ability as moderator by entertaining the participants while pursuing the subject on track. Wow, this is something inimitable. At night, there was Japan Sushi Reception jointly hosted by University of Tokyo and Keio University, supported by Teijin Limited and Sojitz Corporation. Many guests from the political, academic and business world attended. I would think this kind of party should be led by the business community. In fact, it’s the World “Economic” Forum. Just to list a few of the big names that attended from the political world, Mr. Hidenao Nakagawa, Mr. Koji Omi, Mr. Yukio Hatoyama(to substitute Mr. Ichiro Ozawa, the leader of DPJ who could not make it), Mr. Yasuhisa Shiozaki, Mr. Motohisa Furukawa, Ms. Kuniko Inoguchi etc. 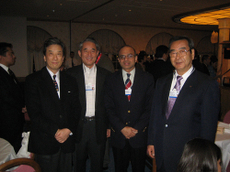 From the business world we had Presidents, CEO’s and Chairmen from various companies like Mr. Okuda of Toyota Motors, Mr. Yonekura of Sumitomo Chemical, Mr. Sakurai of Ricoh and Japan Association of Corporate Executives, Mr. Nagashima from Teijin, and Mr. Hasegawa from Takeda Chemical, etc. Ambassador Fujisaki, Mr. Kono the G8 Summit Sherpa and Councilor to the Foreign Ministry, Imai-san and Kuniya-san from NHK, Mr. Xu Zhihong, President of Peking University, Dr. Tachi Yamada of the Bill & Melinda Gates Foundation, Global Health Initiative also joined and we discussed about Japan’s contribution. 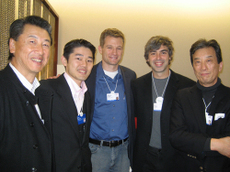 Mr. S Brim, Founder of Google also showed up briefly. 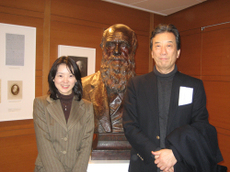 Also Dr. Yamanaka from Kyoto University, who is gaining fame by his research in iPS cells, was also there. As Prime Minister Fukuda will participate this year, there is a mixed emotion of expectation and anxiety among us, as to how much he can communicate a high vision and powerful political messages expected of as one of the world’s political leaders. 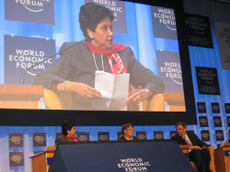 The annual World Economic Forum will be held in Davos at the end of January. This will be my 8th attendance in a row. Please refer to some of my past blog in January. Last year and this year, too, there is not much snow even around this area known for its snow and for skiing. Yesterday we had some snow fall, but today the weather is crystal clear. Prime Minister Fukuda will give a speech on the 26th, so I heard that there are many people from the business society of Japan this year. It’s a good thing. 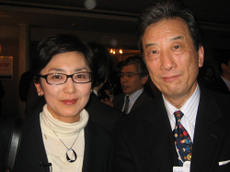 Mr. Okuda, Chairman of Toyota Motor Corp., will also be arriving on the 24th. On my way to Davos, I was on the same flight with Ms. Sadako Ogata, President of JICA, Mr. Yonekura, President of Sumitomo Chemical (both were accompanied by their spouses) and Imai-san from NHK. 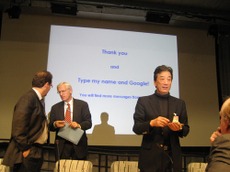 As for me, I talked about “the decade for Google”, “the decade for Apple and its revival with the creation of iPod and iPhone”, “the big success of Nintendo ‘Wii’ by creating a new model of non-videogame users (e.g., grandpas playing with their grandchildren”, “Negroponte’s ‘One laptop per child’ being a breakthrough of software concept” etc. I showed some examples of innovation from the recent global society that is becoming ‘flat’ and pointed out that people’s awareness to contribute to global issues are expanding throughout the world. In addition, I mentioned that the 2006 and 2007 Nobel Peace Prizes sending messages to potential answers and policy-making processes to the global issues, which is an epiphanic to the goals for innovation and I think they agreed to my point. I have pointed out these issues in my blog on January 3rd and 10th, so I hope that my blog readers also understand my point as well. After that, there was a session where we had to come up with new proposals by discussing with the person seated next to you. There were a number of interesting ideas. I was quite impressed by the process and some of ideas! I was very grateful to hear later some positive feedbacks that my arguments were clear and stimulating. Let’s offer compliments on good outcome on global issues, especially to our children! In this year’s Davos meetings, there are “28” sessions related to Climate Change. This shows the huge and wide awareness in the business sector of the world. It looks as if Japanese industries are the only ones staying in their own shell. In a later session, I met Dr. RK Pachauri, the Chairman of IPCC who has been awarded last year’s Nobel Peace Prize. Let’s look forward to his visit to Tokyo next month (note: this was later cancelled, but I was with him later in New Delhi). 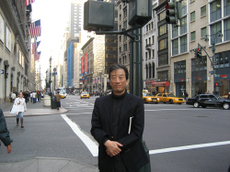 In a recent interview 2050: The Odyssey Begins （The Japan Journal　January, 2008）, I made my view crystal clear of the challenges of Japan and its responsibility as a global citizen nation. Otherwise, Japan may be buried as a forgotten quiet and retracted islands. Another quotation of my comments by Mr David Dickson also appeared in Science and Developoment Network almost a few days ago. Yes, Japan has to face the reality of the globalization and share its fare responsibility despite of her own huge internal resistance and problems. Yes, we can do a lot more, if the policy frameworks are set just right and with good leaderships in every sector of the society. I am attending the WHO Commission for Social Determinents of Health（CSDH） held at WHO Kobe Center from the 16th. Kobe Center serves as one of the hub of CSDH and 16 Commissioners are participating this time. As I have reported in my blog about the CSDH that started in March, 2005 （Beijing、Vanacouver、Geneva、Nairobi etc.） this is the 10th and will be the last conference and the final report is due in June. 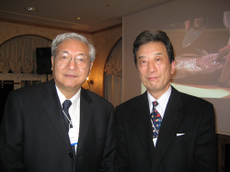 Thanks to Dr.Iwao, former Chief of Ministry of Health, Labor and Welfare who headed the WHO Kobe Center until December 2007, just until 2 weeks ago, for this meeting in Kobe. I’m happy that this was Dr. Kumaresan’s first big task after he newly took office in January. Former Director Dr. Iwao, new Director Dr. Kumaresan, the Governor of Hyogo Prefecture and the Mayor of Kobe attended the reception held at the night of 16th. And today, January 17th marks the 13th year of the Kobe earthquake. WHO Kobe Center was established the following year after suffering from the damage. This is the last conference of CSDH and will be the only one held in Japan. This year, Japan will host conferences that will attract the world’s attention like the TICAD and G8 summit. Also, it is the mid year of the United Nation’s MDG（Millennium Development Goals）. “Global Health” is one of the major global agenda. Last November, Minister of Foreign Affairs, Mr. Koumura addressed its importance in his speech and the content was published in Lancet. This year, Japan will attract a lot of attention from the world which will also mean that it is a year of heavy responsibility as well. Nevertheless, stock prices are dropping in the year-end through the new year and sentiments are inward-focused in a stagnant mood as usual, don’t you think? To cope with this environment, Prime Minister Fukuda will attend the World Economic Forum in Davos in the end of this month and make a speech. There will be a policy speech tomorrow (18th), and the Davos Meeting speech will follow, so the staff at the Prime Minister’s office will be very busy. With the understanding said above, we asked the Commissioners of CSDH to come to Tokyo in the morning of the 15th to pay a courtesy call to Prime Minister Fukuda and Minister of Foreign Affairs Mr.Koumura. In the afternoon, we held a global conference on “Global Health as Global Agenda” with the presence of Mr. Masuzoe, Minister of Health, Labor and Welfare. 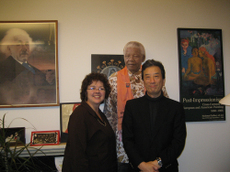 It was our attempt to urge the domestically focused Japanese to look at more global issues. It turned out to be very successful with about 200 enthusiastic participants. Keynote speeches and the panels were all wonderful. The Commissioners were also very happy about it. As being a member of the Commissioner myself, I was also very satisfied. Thanks to you all who have participated, the success is to your credit. On January 6, I went to Washington DC from Narita airport. It was very warm just like last year. 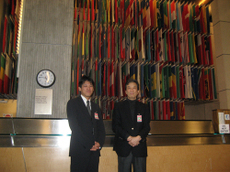 In the afternoon, we went to the Holocaust Memorial Museum along with Mr. James Kondo, my colleague at Health Policy Institute, our “Think Tank.” The plan and building of the museum had been well designed but I felt the stupidity of mankind. With only slight differences, the same things are happening again and again even today somewhere in the world and it is madness. Preserving, exhibiting and exposing such historical records and documents are very important. Otherwise nothing can be learned and the same things could happen again and again. It’s foolish isn’t it? 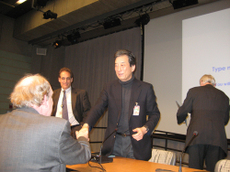 The following day, on January 7, there was a meeting with the National Academy of Sciences (NAS) in the morning. (Photo1). Lunch for me was arranged in the members’ lounge, exclusively for the members of National Academy by invitation of Dr. Nina Fedoroff, Scientific Advisor of U.S. Department of State. It occurred to me then I could have used this lounge since I was a member of Institute of Medicine (IOM) too and we talked about various topics with Dr. Fedoroff and Mr. Arimoto. We were able to network with various people while talking and Nina was kind enough to making several phone calls. On that day, there was a board meeting of IOM coincidently, thus I came across my old friend, Dr. Victor Zhau (Mentor of Dr. Ryuichi Morishita of Osaka University, well known in Digital New Deal a forum to support as a cheering group member of ‘Innovation 25’). 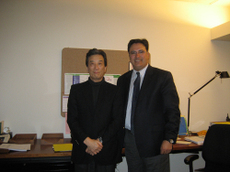 Dr. Zhau is now a powerful person running every thing from the medical school to the hospital at Duke University. 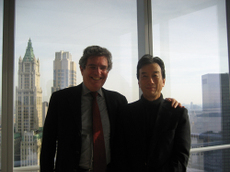 I also met Dr. Fineberg, President of IOM with whom I had lunch just 1 year back. It is good to have professional friends. I also met Dr. Bruce Alberts, the President of the National Academy for 12 years, who had devoted his special attention to support developing countries. This is the first time we had met since last October. He told me that he has returned back to the University (UCSF) but the work is becoming monotonous. He will become an Editor-in-Chief of “Science” magazine this coming March. So I joked with him “You will be famous won’t you!.” In the afternoon, I visited the World Bank and met Mr. James Adams, Vice President of East Asia and Pacific Region and Mr Alfred Watkins, Science and Technology Program Coordinator. I gave a lecture about 'Innovation for Development' for about 45 minutes in the auditorium. You can watch it on the webcast. Though it was the beginning of New Year, lots of Japanese were in attendance as it seems Japanese embassy announced. Many questions were asked and it was fun. 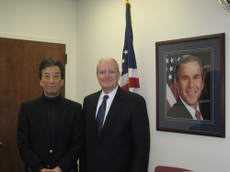 In the evening I visited Dr. Marburger, scientific advisor of President Mr. Bush (Photo5, 6). After that, I returned back to the National Academy and met Dr. Charles Vest, who has been a Principle of MIT for more than a decade (Photo6). 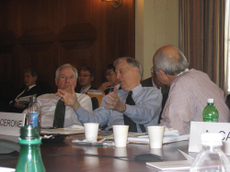 In this way I could meet heads from all three academies of the National Academies in one day. I had to excuse my self during dinner and returned to New York from Ronald Reagan Airport. It was one busy day! The temperature during the day was 18 degrees and really warm. The temperature last year was more than 20 degrees. Is this proof global warming? !